This post was sponsored by Simple Mills. As always, all thoughts and opinions are my own. 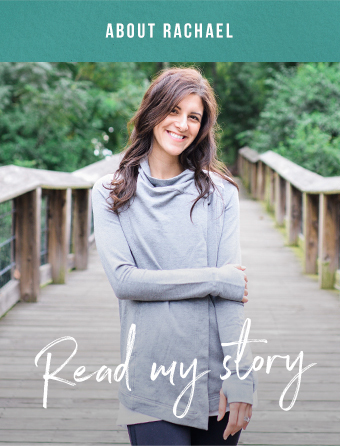 Thanks for supporting the brands I love that make this blog possible! When it comes to food holidays, I think Easter is vastly underrated. I mean, on what other holiday is it socially acceptable to start your day with caramel filled chocolate eggs and not actual eggs? Also, brunch. Any holiday that involves brunch gets my vote. 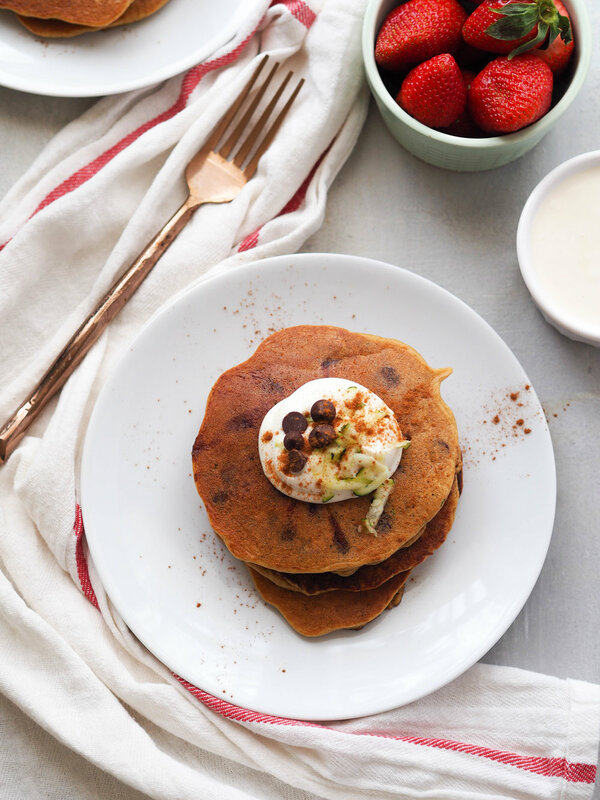 This Easter, I highly suggest whipping up a batch of these zucchini bread chocolate chip pancakes with maple Greek yogurt topping for your holiday brunch. They’re super light and fluffy and moist and tender, plus DARK CHOCOLATE CHIPS Y’ALL! If your goal on Easter is to eat chocolate at every meal, these pancakes will definitely help you meet that quota. These pancakes were inspired by the zucchini bread chocolate chip cookies I’m kinda famous for. For some reason, I haven’t made them in ages, but I used to make them for almost every holiday and tailgate. Maybe one day (if you ask nicely!) I’ll share the recipe on the blog. Making these pancakes, and thinking back to all those batches of zucchini bread cookies I made, I was thinking about how nourishing it is to share food with other people. As humans, we evolved to connect over food, and sharing food as part of a community is a big reason why we’re so successful as a species. Cooking for and sharing food with others taps into that. When I think about what makes holidays special, it’s connecting with family over really delicious and soul-nourishing food. Hopefully this Easter it’s over a stack of these yummy pancakes! 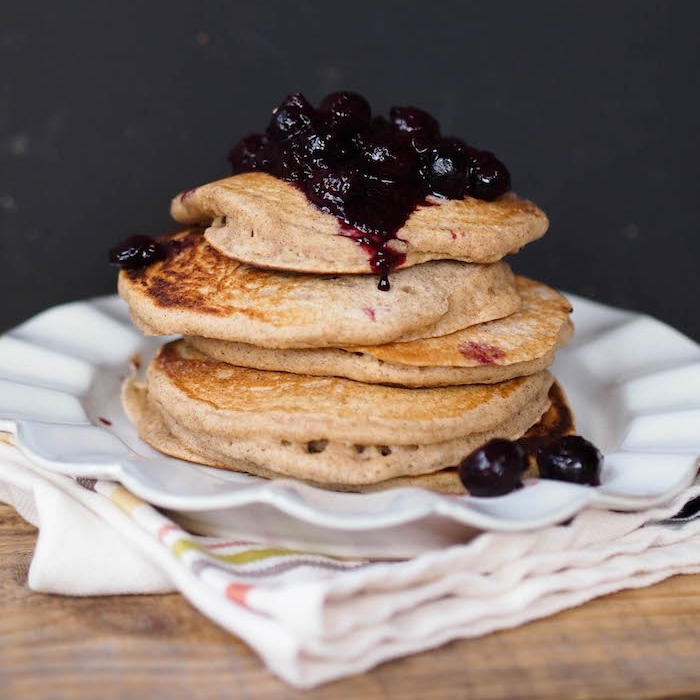 I made these pancakes with Simple Mills almond flour pancake mix. It’s made with a blend of almond flour, coconut flour and arrowroot, and sweetened with a hint of coconut sugar. If you’ve been following this blog for awhile, then you know how much I love to bake with almond flour – it’s nutty flavor and soft texture is heavenly in muffins and cookies and pancakes. Simple Mills makes it easy with all their yummy baking mixes – check out their artisan bread mix, and banana and pumpkin flavored muffin mixes too! I’m a huge fan of their products, which are all made with simple ingredients. Prepare them according to directions, or flavor them up with fun add-ins (again, highly recommend CHOCOLATE!). If you can’t find their products in your local grocery store (they have a wide selection available at Rosewood Market, Whole Foods and Kroger here in Columbia), you can easily order online on the Simple Mills website. 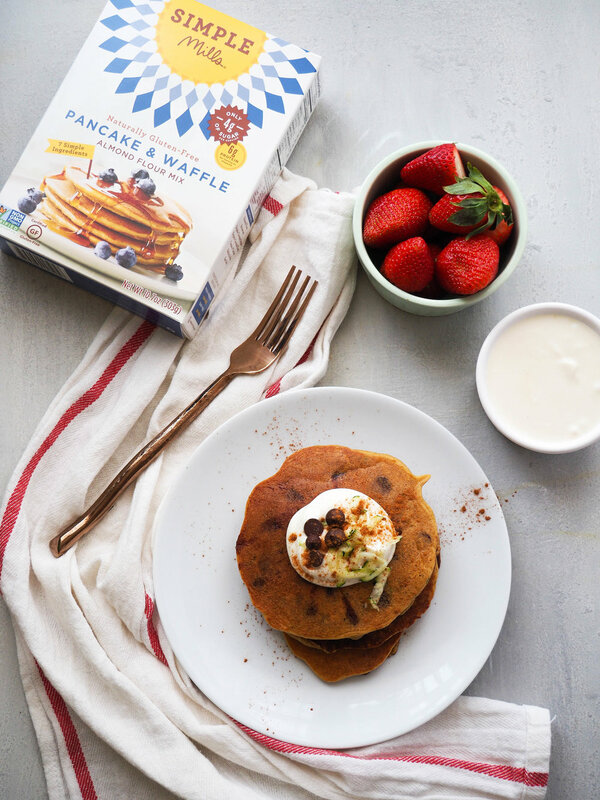 While your family might think you’re too old for an Easter basket, I think we’re never too old for baskets of goodies, which is why I partnered with Simple Mills to host a giveaway of their pancake and waffle mix on my instagram account. Head over to @RachaelHartleyRD on instagram to enter! 1. In a medium bowl, whisk together pancake mix and spices. Add eggs, almond milk, and oil and whisk until well combined. Stir in zucchini and chocolate chips. 2. Heat a large skillet on medium heat. Add a dab of butter, coconut oil or spray to cook the pancakes. When hot, add scant ¼ cupfulls of batter to the skillet, being careful not to overcrowd. When the pancake starts to bubble, carefully flip and cook for an additional minute on the other side. Repeat with remaining batter. 3. While pancakes are cooking, whisk together Greek yogurt and maple syrup. 4. Serve pancakes dolloped with Greek yogurt topping and an additional drizzle of maple syrup, if desired.